So it’s clear that owls are still big, at least where I live. And in the world of Jenni at the Vintage Umbrella, too, though her owls are actually quite small. Check out her free pattern for a wee owl ornament you can hang from your tree, add to a package or use to decorate just about anything you want. 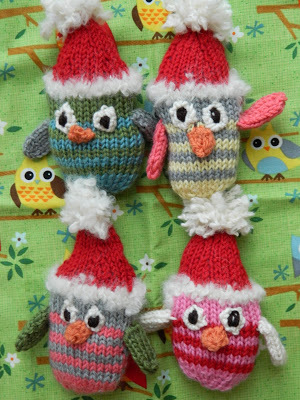 It’s made holiday with the addition of a Santa hat, but you could work the hat in a different color if you wanted to make these cuties for any occasion. The pattern does not say what weight of yarn or size of needles was used, though it looks like a light worsted. I’ll bet they’d also be cute — and even smaller! — worked in sock yarn. So sweet! Thanks for the post! I’m the author of the pattern and it uses baby cashmerino which is dk weight! Happy knitting! Congrats on finishing your book!!! !